I’m back with another healthy holiday gift guide! This week’s guide is for all of the little people in your life. 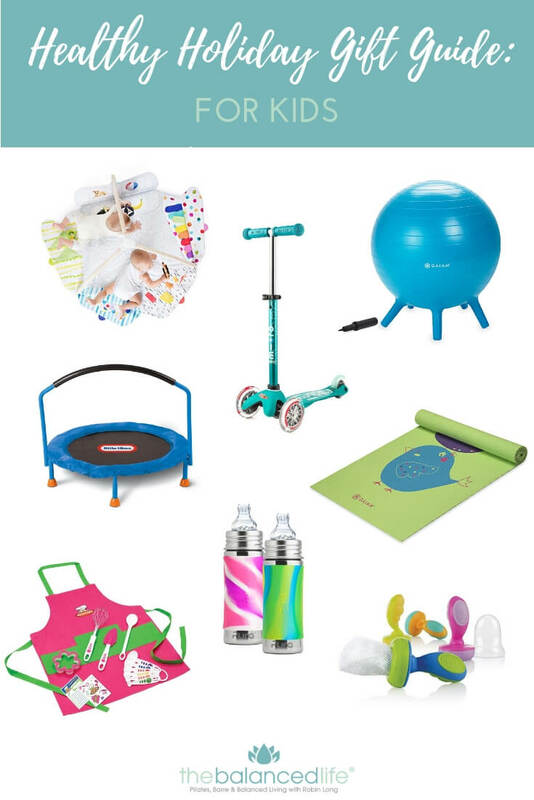 Healthy Holiday Gift Guide: for kids! // Micro Mini Deluxe Scooter: We got this for my daughter last year and it gets more use than anything we own! It’s stable, sturdy, and easy to use. I highly recommend it! // Gaiam Kids Stay-N-Play Balance Ball: I love this ball for kids who need to get their wiggles out. It’s used as a chair, which not only helps to improve focus, but also builds core strength! // Mini Trampoline: A great opportunity to encourage an active lifestyle for your little ones! // Gaiam Kids Exercise Mat: A perfect gift for your little one to join you for your workouts! // Curious Chef Kit: Inspire a love for cooking with these adorable aprons and cooking utensils. Kids will feel empowered having tools of their own. I love the idea of inspiring a love for home-cooked food and special bonding time in the kitchen. // Pura Stainless Sippy Cups and Water Bottles: We’ve been using these for years and love them! I appreciate that they are durable, plastic-free, and transition with your kids as they grow with a simple change of the top. // Nuby Nibblers: These are great for introducing healthy, whole foods into your baby’s diet! My kids especially love frozen fruit when teething. I hope you find this gift guide helpful as you’re shopping for the little ones in your life this year! PS – Check out my gift guide for Pilates lovers here!